PRODUCT DESCRIPTION: Low odor white liquid which is mixed with water and sprayed for pest control. It is a micro encapsulate which means it lays on treated surfaces better than emulsifiable concentrates and will last longer and be more active because of this physical trait. WHERE TO USE IT: Labeled for use both inside and outside the home on a wide range of pest. 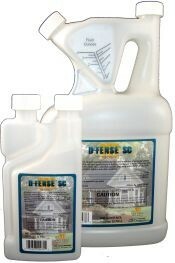 On the outside foundation wall and siding, create a wide band of treated surface to stop spiders, scorpions, crickets, roaches and other pests (listed below) from entering. You may need to spray the whole side of a building if the migration is severe. Also use it along the border of where mulch, turf and cement meet. Can be applied around plants and shrubs, air conditioners and decks. For inside the home, spray carpets, furniture, baseboards and other areas where pests are active. RATE OF APPLICATION: You may need to treat every few weeks for several weeks straight when treating outside during heavy pest pressure. In the home, treatments will last 1-2 months for preventive applications but plan on spraying once a month when treating an ongoing active problem. MIXTURE RATES: Add .75-1.5 oz per gallon of water and plan on spraying the gallon over 1,000 sq/ft of surface area. The treatment will not stain but remember, water is the carrier so only spray what you know will be okay when wet by water. Allow treatments to dry 2-4 hours and once dry, go back to using the area as before. TARGET PESTS INCLUDE BUT NOT LIMITED TO: Ants, army worms, asian lady beetles, bees, bedbugs, bluegrass weevil, boxelder bugs, carpenter ants, carpenter bees, carpet beetles, cecid flies, centipedes, chiggers, chinch bugs, cloth moths, cockroaches, crickets, cutworms, earwigs, elm leaf beetles, elm spanworms, fall webworms, fire ants, firebrats, flea beetles, fleas, flies, fungus gnats, gnats, grass hoppers, green striped mapleworm, ground beetles, gypsy moths, hornets, japanese beetles, june beetles, killer bees, lace bugs, lady bugs, leaf feeding caterpillars, leaf hoppers, leaf rollers, leaf skeletonizers, lice, loopers, mealybugs, midges, millipedes, mimosa webworms, mites, mole crickets, mosquitoes, moths, oak worms, pantry pests, pillbugs, pine sawflies, pine shot beetles, pint tip moths, pinyon midges, plant bugs, redhumped caterpillar, red imported fire ants, sawfly larvae, scale insects, scorpions, silverfish, sod webworms, sowbugs, spanworms, spiders, springtails, tent caterpillars, termites, ticks, yellowjackets, yellownecked caterpillar, wasps, webworms, willow leaf beetles, wood infesting beetles.